While having a rummage through my vast and jumbled craft box and I found a small rag doll that I had started to make a few years ago. I was making her for my wedding, the intention being that my flower girls would carry them carry instead of flowers. The poor lady though, never got as far as having as having a proper haircut or even getting dressed! I didn’t want to make another doll like her. She was really quite complicated, and hand sewn! 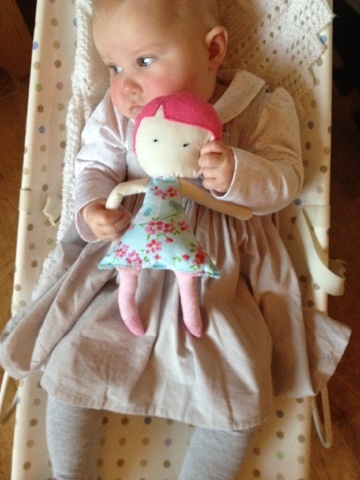 However, she did inspire me to make a simpler rag type doll. I got some pattern paper out and drew a circle for a head and added a little neck. A big triangular body, and skinny arms and legs. I cut out all her appendages in various fabrics. Her face and arms from a creamy calico type fabric. Her body from a gorgeous blue and pink floral bird print fabric that I picked up in John Lewis. (I will update with the make of the fabric as soon as I find it!). 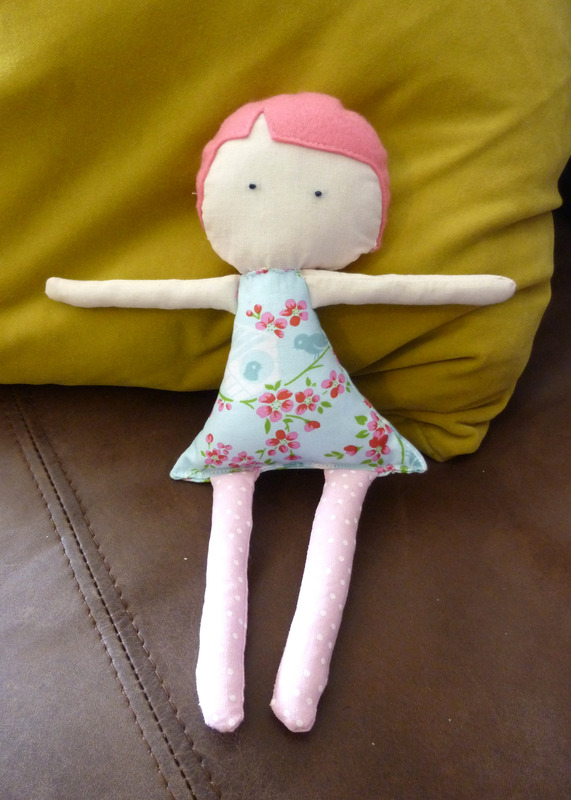 Her legs were made from a spotty pink scrap that I had from a quilting fat-8 pack that I picked up in Hobbycraft. What about hair? Felt, naturally! I was going to give her a contemporary twist on a cool 30’s type bob. So, I cut out two circles in bright pink felt, then with a pencil drew the shape on the hair on one and cut it out. I attached the hair with small back-stitches to one of the pieces that would make up her head. She also needed eyes, so 2 small French knots later our little lady could see. That would be all she’d have as I wanted to keep her features really simple. Now, to assemble her. 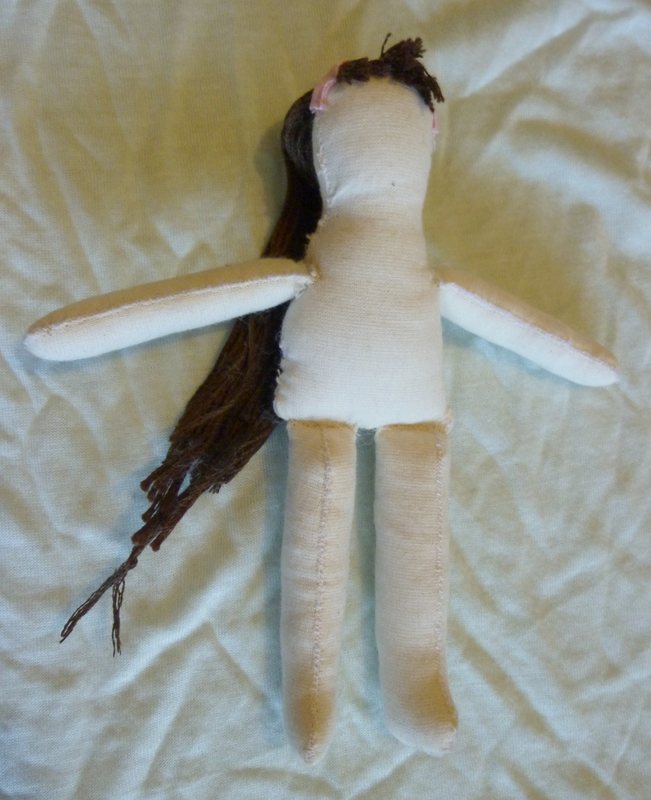 Her head, arms and legs were all sewn – leaving appropriate gaps for stuffing – which I stuffed with toy stuffing. Her body was a little trickier as everything needed to be attached to it. But one squishy limb at a time she came together. But something wasn’t right…. She was wonky! Her head was a little off centre. It didn’t matter; somehow it made me like her more and I couldn’t wait to show her to Bex the next morning. Molly waiting to enjoy her first Harts and Carafts coffee morning! Over coffee and cupcakes, Wonky got named Molly, and then went to live her new best friend, Lil M.
Here is Molly Wonky-Head and the adorable Lil M! Since then another Wonky-Head has gone to live in Dublin, and I am working a boy Wonky-Head. If he becomes a reality, I’ll pop a picture on our Facebook page.